The Lanius are metallic lifeforms that don't require oxygen to survive. Earlier in the year, Faster Than Light developer Subset Games announced it was working on an "advanced edition" of the game, that will be available as a free update. 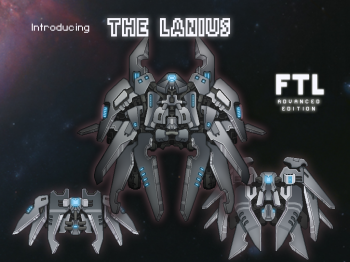 Now, they have announced that among previously revealed features, the advanced edition will feature a new alien race, the Lanius, as well as a Lanius ship. "The Lanius are scavengers - metallic lifeforms that rely on the absorption of minerals to sustain themselves. Their society ebbs and flows in hibernation cycles; they may lie dormant for many years, even while hurtling through space. As soon as they become aware of significant metal deposits they reawaken. Usually this occurs in the dying stages of a galactic civilization or in the wake of intergalactic war." The Lanius don't require oxygen to survive, and will actually passively drain any room they inhabit of oxygen. This should make for some interesting boarding strategies, although they may cause trouble if you have any non-Lanius crew members on your own ship! Type C Ship Layouts: 8 of the original ships will have a third layout that capitalizes on the new content. With the Lanius ship, that makes for a total of ten new starting ship designs. Backup Battery Subsystem: Subsystem that can provide temporary reactor power in a pinch. New Drones: Expanded drone options includes: the Shield Drone that generates a green super shield for your ship, the Anti-Combat Drone that shoots down enemy combat drones, and the Ion Intruder that blasts into the enemy ship and randomly ionizes systems while stunning and distracting crew. The Advanced Edition of Faster Than Light is due out in "early 2014".